Home Reports Gun Ownership Mapped: How Many Guns Each State Had in 2017? Gun Ownership Mapped: How Many Guns Each State Had in 2017? According to the Pew Social Trends three out of ten adults in the USA say they currently own a gun. In fact, about 42 percent of households own at least one. The interactive map below shows the extent of gun ownership in each state according to the ATF 2017 report. Yet, here is the remarkable truth that most gun enthusiasts understand. Namely, that ATF stats only tell half the story. Moreover, stats put together by government agencies are subject to political manipulation. 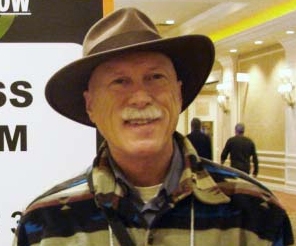 Since we all know our favorite Uncle Bob who hides about 10 guns under his mattress we can say with certitude that the publish stats likely contain a margin of error. However, since we also know Uncle Bob would never talk to the feds or statisticians about their guns we have to rely upon the public data for context. Doing so, we can come to some pretty certain determinations on how heavily armed your state just might be. What we do know for certain is that Americans love their guns and if the stats only tell half the story we know they love them dearly. In 2017 Texas, with its large population of nearly 28.3 million, it heads the list with 588,696 registered firearms. That’s about one in every 47 persons in Texas owning a gun. If you believe that theory then might we suggest you walk into a restaurant hosting 50 Texans and try to stick up the place? Then, please report back to us if only one gun was pointed at your face 5 seconds later. However, given the consistency of the flawed data we can extract some trends. Namely, don’t mess with Texas as it leads the pack. Click on any state in the map to see the details. Firearms have a huge cultural significance in the United States—most certainly more than in any other country. In fact, they have become symbols of American freedom and culture. Why? Because Americans have always taken seriously their Second Amendment right to keep and bear arms. More than half of the gun owners surveyed cited the need for protection. However, 43 percent of men and 31 percent of women said they used their guns for hunting and sport shooting. Ok, perhaps a reasonable stat as Americans are not getting in firefights every day. Yet, in reinforces the trend that guns are intended for peaceful purposes more often than opponents of the 2nd Amendment would like you to believe. 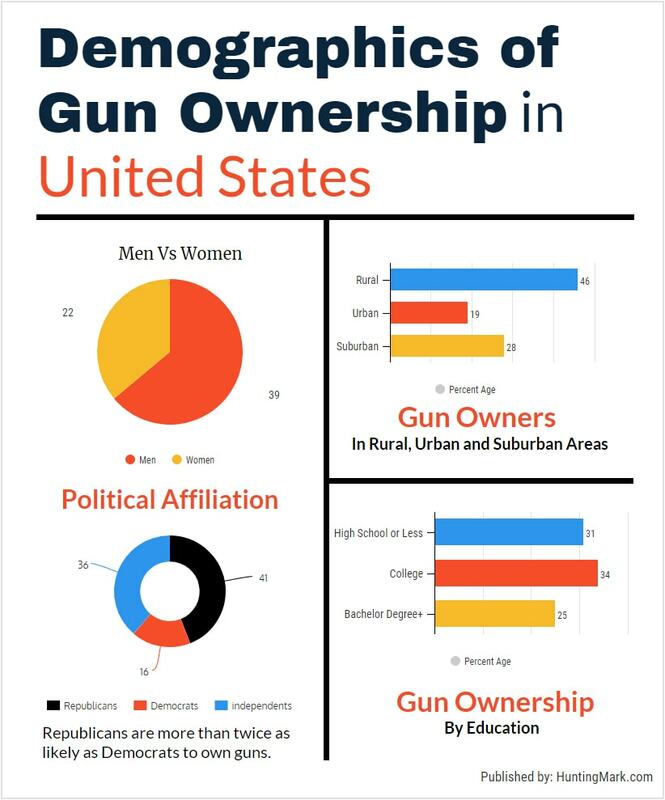 More men (white men in particular) than women own guns. And while 46 percent of rural people own them, only 28 percent of suburbanites and 19 percent of urban dwellers do. Republicans are more than twice as likely as Democrats to say they possess them. However, let’s examine the trends and not the data that fails to account for Uncle Bob’s under the mattress stash. Yes, rural populations are more likely to own guns. Republicans are more than twice as likely as Democrats to own guns. (41% vs. 16%). Guns are owned by 25 percent of bachelor’s degree holders, 34% of those who have some college education and 31 percent of those who hold a high school diploma or lesser qualification. More than half of all gun owners live in the northern half of the USA. Draw what you want from that data trend, but we say it means smart people own guns. Guess which USA state has the most guns per capita? Remember, gun data is notoriously hard to come by and frequently politically manipulated. So we are looking at the trends here to gain as close a picture as we can. If you guessed California or New York or Illinois you’d be wrong. New York actually ranks fifty-first, with only 3.8 guns for every thousand residents. Number One happens to be Wyoming, which boasts the highest number of registered guns per capita of any state. Wyoming has 229 guns for every thousand residents. That’s 132,806 registered weapons in a state that has only 579,315 people. While those stats are likely off by a few million guns in each state, the trends tell a story. New York has embarked on a fanatical streak of gun laws that most likely would lower gun ownership throughout the state. Meanwhile, the great American west is the land of the pew pew pew and the citizens of Wyoming have little restrictions. Statistical analysis: when Americans are allowed to have guns they get them. Freedom anyone? The last stat is remarkable due to California’s strict gun laws. However, it provides another unique insight. Statistical analysis: when Americans are not allowed to have guns they still want them and get them anyway. Latest ATF stats says Wyoming has the highest number of registered guns per capita (229) but in total numbers Texas leads all the states, with about 588,696 weapons. California comes second with about 344,622. Of course, these statistics need to be understood in context. It’s helpful to remember that Wyoming, with its reputation for hunting and shooting, has only 580,000 people in the whole state, while Texas has a whopping 28.3 million people. That’s just shear math, but the trends line up with other unofficial data points on gun ownership. Below is a graph of the top ten states that have most registered guns. According to the website of the NSSF (the firearms industry trade association) the economic growth of the weapons and ammunitions industry over the years has been “nothing short of remarkable.” With each new report of gun laws coming down the legislative path Americans rush to buy guns and ammunition. Consequently, this past 8 years has been a gold rush for the gun industry. The NSSF points out how the companies who make, distribute and sell sporting firearms, ammunition and supplies benefit the national economy. 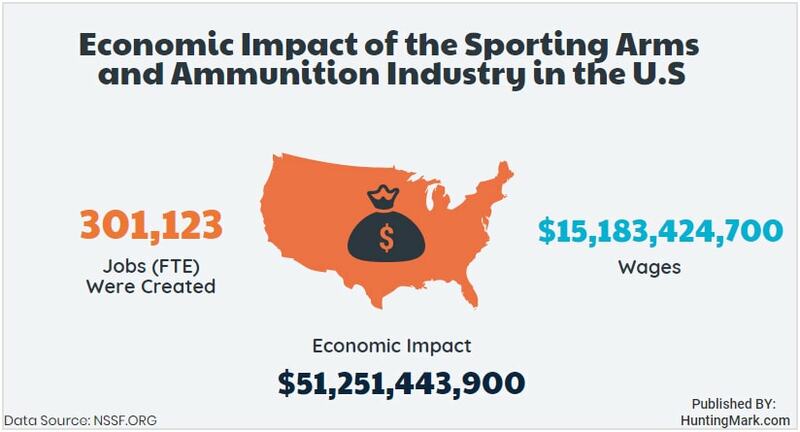 In fact, the induced economic impact of the U.S. sporting arms and ammunition industry in 2017 was estimated to be as much as 51.3 billion dollars. They point out that the industry generates thousands of jobs and brings in huge tax revenues to the state and federal government. Employees pay more than $6.5 billion annually in federal and state taxes of all kinds. In 2016, importers, manufacturers or dealers in NFA firearms paid just over $6 million in occupational tax. Other taxes on firearms, including transfer and making tax, came to about $62.6 million. Most firearms that are imported come from Austria (1.3 million annually) or Brazil (727,000). 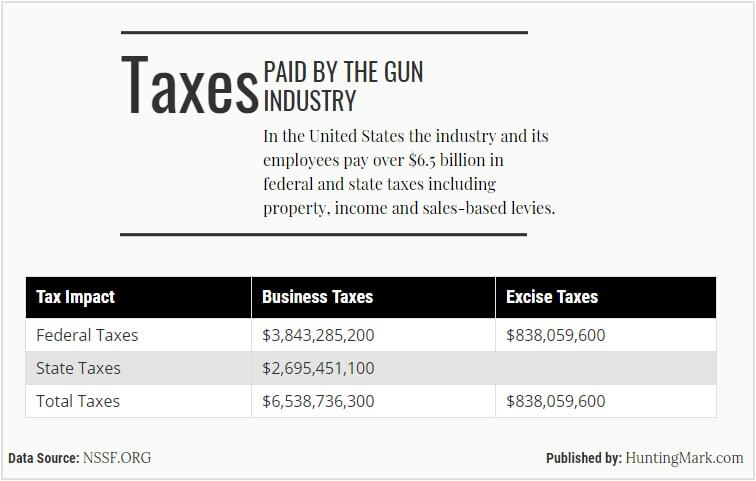 According to a 2017 NSSF impact report,, In the United States the industry and its employees pay over $6.5 billion in federal and state taxes including property, income and sales-based levies. How Many Firearms Are Manufactured Each Year? Between 2001 and 2015, according to the latest data available, the annual totals varied from 2.9 million (in 2001) to 9.3 million (in 2015.) Overall, the production of firearms averages about 5.5 million per year. According to a report by the United States Department of Justice Bureau of Alcohol, Tobacco, Firearms and Explosives, 9.3 million firearms were manufactured in 2015. These comprised 3.7 million rifles, 3.5 million pistols, 885,000 revolvers, 777,000 shotguns and about 447,000 “miscellaneous weapons” such as starter guns, pistol grip firearms, and frames and receivers. And a lot of people apply for licenses each year to own gun, but not everyone who applies gets one. The investigations by the National Instant Criminal Background Check System (NICS) in the USA are used by Federal Firearms Licensees (FFLs) to decide on the spot whether someone may buy explosives or firearms. 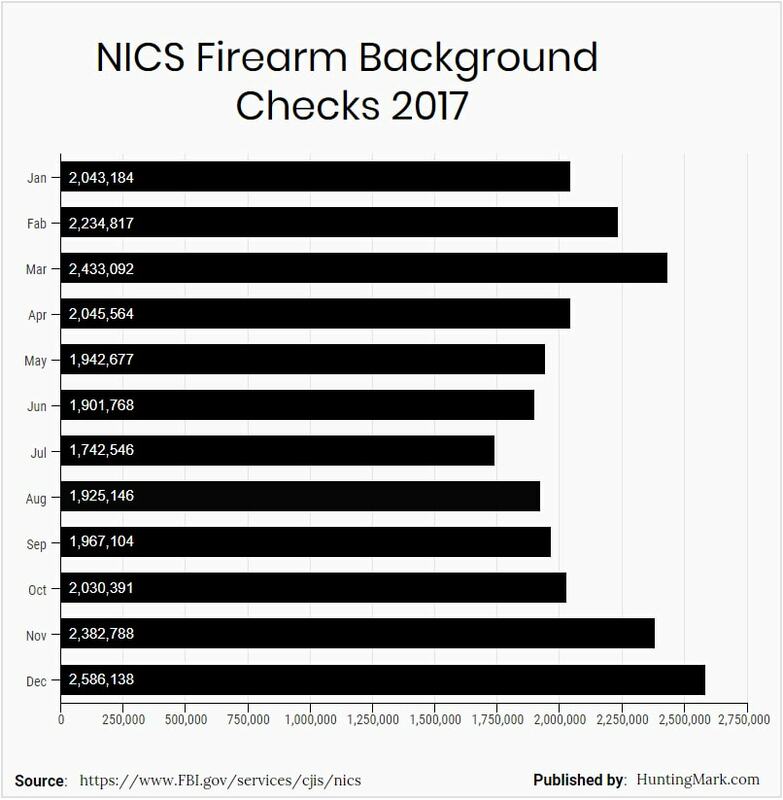 In 2017, there had been a total of 25,235,215 background checks. Below is a chart of the types of weapons that may be registered, and the quantities involved. As for hard statistical data, there is a reason that it is hard to come by. For Americans, gun ownership is very personal and just because your momma told you never to lie doesn’t mean you should tell the government about every firearm you own. Without a doubt, this permeates every gun survey you could find. 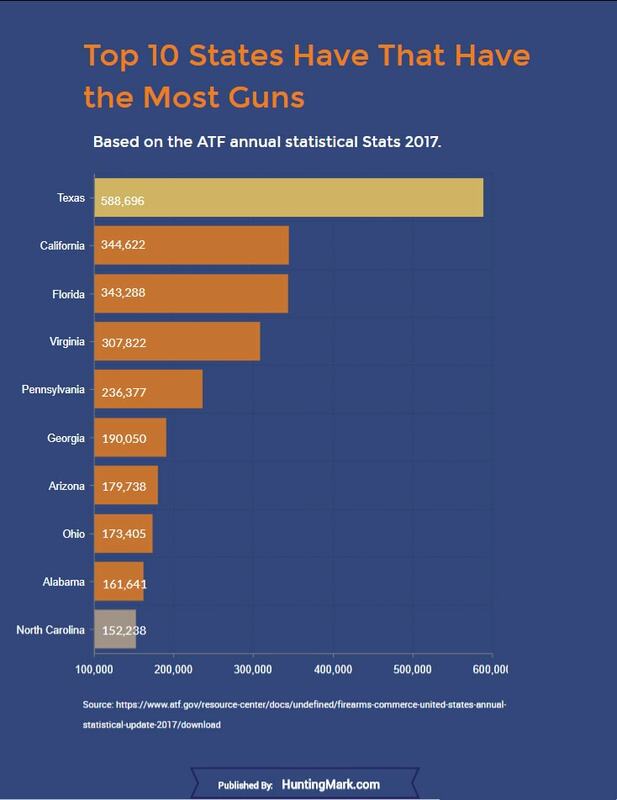 Unfortunately, the ATF stats are taken as the gospel by far too many and we truly don’t have enough time to get into what all is wrong with them. However, look what these Gun Pros found wrong in 2013 stats. And most of those issues are still there in the latest stats. We all know those stats have big issues but still they do speak to trends that we think are reasonable even if every data point is off by a few million firearms. So how heavily armed is your state? That’s going to take a lot more honestly from Uncle Bob. However, how heavily armed is your state compared to the others? That’s where glean some truth from the data. Where there is smoke there is fire and where there are 10 counted guns there are likely 10 more under Uncle Bob’s mattress. You decide for yourself. 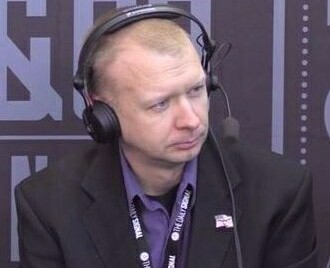 Jeff Edwards is Marine Veteran who served with Kilo Company 3rd Battalion 23rd Marines. His unit deployed to Iraq in 2003 and served primarily in the Wasit Province in the city of Al Kut. He is a blogger & his blog has crossed millions of readers tackling some of the nation's serious issues with both humor and truth. And now he is working with HuntingMark as a writer. You maps “per capita” figures are out by a factor of 10 based on the population and registered guns figures in the same tooltip.